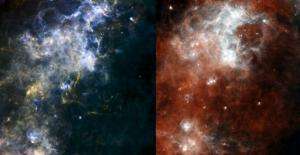 (PhysOrg.com) -- Herschel has delivered spectacular vistas of cold gas clouds lying near the plane of the Milky Way, revealing intense, unexpected activity. The dark, cool region is dotted with stellar factories, like pearls on a cosmic string. 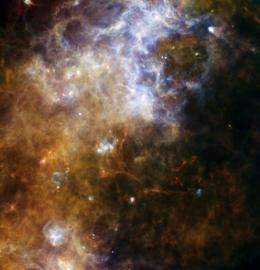 On 3 September, Herschel aimed its telescope at a reservoir of cold gas in the constellation of the Southern Cross near the Galactic Plane. As her telescope scanned the sky, the spacecraft's SPIRE and PACS instruments snapped the pictures. The region is located about 60° from the Galactic Centre, thousands of light-years from Earth. The five original infrared wavelengths have been colour-coded to allow scientists to differentiate extremely cold material (red) from the surrounding, slightly warmer stuff (blue). The images reveal structure in cold material in our Galaxy, as we have never seen it before, and even before a detailed analysis, scientists have gleaned information on the quantity of the material, its mass, temperature, composition and whether it is collapsing to form new stars. That a dark, cool area such as this would be bustling with activity, was unexpected. But the images reveal a surprising amount of turmoil: the interstellar material is condensing into continuous and interconnected filaments glowing from the light emitted by new-born stars at various stages of development. Ours is a tireless Galaxy constantly forging new generations of stars. Stars form in cold, dense environments, and in these images it is easy to locate the star-forming filaments that would be very difficult to isolate in a single-wavelength image. Traditionally, in a crowded region like this, situated in the plane of our Galaxy and containing many molecular clouds along the line of sight, astronomers have had a difficult time resolving details. But Herschel's sophisticated infrared instruments made short work of the task, seeing through the dust that is opaque to visible light, and seeing the glow from the dust itself. These observations are not possible from ground. The result is a view of an incredible network of filamentary structures, and features indicating a chain of near-simultaneous star-formation events, glittering like strings of pearls deep in our Galaxy. Herschel observed as deep-space pearls on a cosmic string? Stars are suppose to light up from Hydrogen fusion. Neutron stars and Black Holes are suppose to be the nuclear embers after fusion is completed. Such activity is to be expected if you have ion and electrons moving in some direction. But what causes the potential across the filament where the beads are(several 1000's of LY), and what ionized the particles to begin with? If you have beads on a string you would expect that to be from magnetic effects ie. the Bennett Pinch effect.. And so from the pinch and marklund convection you would get nucleosynthesis and (atomic) sorting. This paper, arxiv.org/abs/0908.1549 , (Anchoring Magnetic Field in Turbulent Molecular Clouds) was published recently which pretty much depict the Bennett Pinch in the data, although the authors don't seem to make the "connection". This outstanding Herschel image would be a pretty good representation of the above research papers. Perhaps we're seeing a new paradigm in cosmology starting to unfold. Anybody know the coordinates of the above images from Herschel? The press release is vague about the exact location, though it does mention that the images are 2 degrees across. The are probably shots of the Coal Sack dark nebula in Crux-Carina. I'm trying to compose a multiwavelength image of the Coal Sack but without the Herschel coordinates this makes it very difficult. Maybe I need to scour the 2MASS or other relevant IR catalogs for clues. Also, what's up with ESA releasing these photos as a lossy compressed JPEG rather than in lossless formats (like TIFF or FITS). I know these files will be large, but ESA also releases 100+ Mb files on its Hubble sight regularly, so what gives? ... ESA also releases 100+ Mb files on its Hubble sight regularly, so what gives? If you want to cite a sight on the Hubble site, spell it rite!